Sometimes you find a watch that really works visually. This 1964 D. MARTHE 35.5×43.5mm. stainless steel SUPER COMPRESSOR cased dive watch really has a lot going for it. The case style, the original glossy black dial with silver gilt print…especially the script in “special super”-all of it…very cool. The super compressor crown is original. 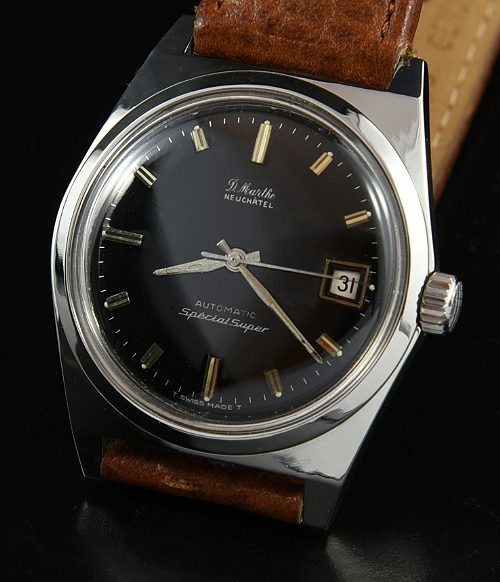 This watch has an ETA 2472 automatic movement-cleaned…accurate. You won’t be seeing another of these.Hurry. $995.